Product #2584 | SKU AT4047MP | 0.0 (no ratings yet) Thanks for your rating! Multi-pattern Large-diaphragm Condenser Microphone with Omni, Cardioid, and Figure-8 Patterns, Low-cut Filter, and 10dB Pad. 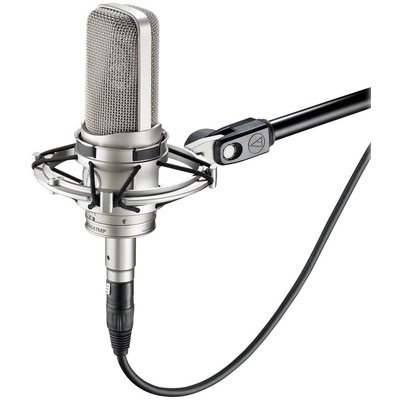 The multi-pattern AT4047MP condenser mic from Audio-Technica is a mic locker must-have! The AT4047MP gives you three switchable polar patterns (cardioid, omni, and figure-8), incredibly low self-noise, and, best of all, an amazingly warm, vintage-style FET character. The AT4047MP excels on vocals, acoustic instruments, and ensembles, and its high SPL handling and robust construction make this versatile mic a long-term studio performer! Equipped with both a low-cut filter and a 10dB pad, the Audio-Technica AT4047MP gives you classic performance and modern flexibility. Audio-Technica's AT4047MP delivers vintage sound in a multi-pattern design with selectable omnidirectional, cardioid, and figure-8 polar patterns. The microphone's transformer-coupled output and specially tuned element provide sonic characteristics reminiscent of early FET studio microphone designs. The AT4047MP makes a great value; it's like having several quality mics in one! With a wide dynamic range, incredibly low self-noise, and high SPL capability, this versatile microphone excels on vocals, strings, acoustic guitar, instrument ensembles, small vocal groups and voiceovers. You can use the AT4047MP to capture sounds up close, thanks to its cardioid setting, 10db pad, and low-cut filter. Or, you can get that magical ambient room sound, via this mic's omni and figure-8 pattern settings.